So there it is – the Higgs, the mysterious particle that causes all things to have a mass. After 45 years of intense searching, researchers at CERN have now detected the existence of the mysterious particle that has been the last unknown piece in the Standard Model of the fundamental laws of physics. Wednesday, the fourth of July. The cheering wouldn’t end. 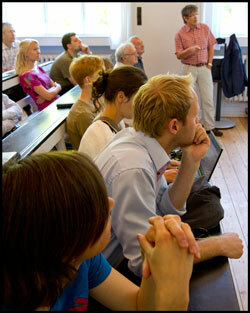 The researchers at the Niels Bohr Institute are gathered in one of the auditoriums to hear the results from CERN. There is a live link to the conference at CERN, the press is invited and everyone is following the presentation of the results intently. 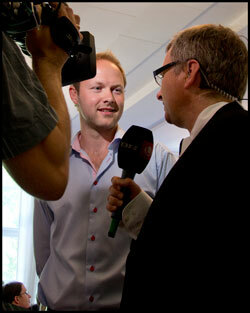 The rumours had been making their rounds in the days beforehand – the Higgs had been found, it was reported. But nothing was certain. There had been rumours before. Then, at 10:45, after a long, very technical and quite incomprehensible presentation for anyone other than a physicist, the cheering broke out and almost raised the roof of the old historic buildings on Blegdamsvej – the stronghold of physics. “This is the start of a new era in particle physics. It is so big,” exclaimed Troels Petersen, who is one of the younger researchers in the research group working with the experiments at CERN. He has worked at CERN for four years and is now back at the Niels Bohr Institute, but like the other researchers, he is always down at CERN in Geneva, where the experiments take place. Approximately 40 researchers from the Niels Bohr Institute are working with the experiments at CERN, the international research centre in Geneva in Switzerland. The experiments are carried out in the huge LHC accelerator, in which four large experiments have been built to examine various mysteries about the structure of our world. 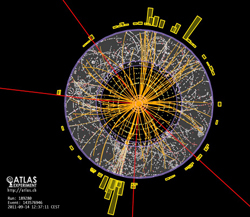 In the CMS- and ATLAS-experiments, it is the Higgs particle that we have been looking for. The CMS and ATLAS experiments have detected such strong signals by combining this and last year’s data from proton collisions that we are talking about a regular observation, something that in technical jargon is called a 5*sigma observation. “Now it is happening – it is the Higgs,” says an excited John Renner Hansen, Professor of particle physics and has been involved with the CERN research since the 70s and is now the dean of the faculty. The Higgs particle is a side effect of a mechanism, which was proposed in the mid-1960s by Robert Brout, François Englert, Peter Higgs and others. The primary function of the Higgs mechanism is to explain why W and Z particles have a large mass while the photon is massless – so it is a construction that gives the Standard Model particles their relative mass. identified as a Higgs decay. The discovery of the Higgs particle has been one of the highest priorities of the LHC-experiments and if the new particle otherwise behaves as predicted in the Standard Model, all of the other predicted particles should be discovered. But so what? – now that the CERN experiments have achieved the big goal? Particle physicist Troels Petersen explains that the discovery of the Higgs particle is a major breakthrough in understanding how elementary particles get mass, but it is not the end of the exploration. It is the beginning of a new era, as it opens doors for the exploration of new physical phenomena. Even with the Standard Model in place, there are great mysteries that particle physicists dream of answering. One of these is the discovery of dark matter, a type of matter that affects how the galaxies in the universe behave, but which cannot be directly observed, as it neither emits light nor reflect light. And even though we have now found a possible explanation for how elementary particles get their mass, gravity is still not described in the same theory – the unification of gravity and all the other forces in particle physics is high on the wish list among physicists. We also don’t know whether something new and completely unexpected is hiding at the high energies that the LHC can collide particles at. At this time, the energy is four times higher than previous experiments and in two years it will double (nearly) again. This could lead to new discoveries about the universe around us. Who knows, perhaps extra dimensions and exciting surprises are hiding around the corner! But today it is the celebration of the Higgs particle that is on the programme for particle physicists at the Niels Bohr Institute. • Mogens Dam, assoc. prof.
• Troels C. Petersen, assoc. prof.